For my card, 2 separate pieces of chipboard are used: The flourish (that I cut in half to have 2 pieces to corner my frame & the polkadot photo frame). 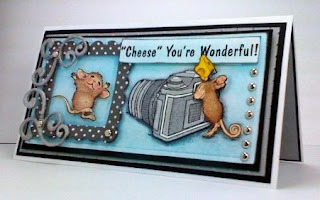 I also used 2 separate HM Stampabilities stamps, one of Muzzy jumping for joy and another called "Say Cheese" from 1996, #HMUR1021. The HM sentiment is from StampaRosa and that's called "Cheese", You're Wonderful! :, #C-11-2421 from 1999. My BG was cut with the LG Rectangle Spellbinders Die and shaded in blues with ANM Chalks. All images are colored with Marvy LePlume Markers, CTMH CHALKS, Glitter Gel markers and Metallic Silver Sharpies. The card was then sprayed with hairspray to hold chalk in place. The Chipboard pieces are raised with foam adhesive for added dimension. Silver brads hold chipboard in place on frame corners and are lined up on one end. Whew! That about covers it all. What do you think of my take on the whole Chipboard challenge?!! I LOVE this America. The fact that you took two stamps and made them look like they are supposed to be together, just genious! What a fun card!!! OH, this is just too ADORABLE!! Love your play on words and your coloring is awesome!! America this is so cute and so creative. Love that he is jumping in the picture, great way to frame it. Such an awesome combo together. you did AWESOME!!! Incredible detail here America. I love your work. Super job. So adorable, love those mice. 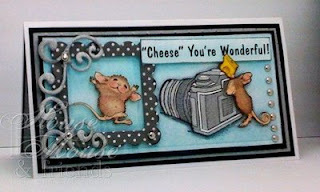 I love how you combined these two stamps together...so so so cute!! And the little frame around Muzzy is perfect!! Love this!!! I love your take on the chipboard challenge! It's awesome. I love the "Say Cheese" image, and how clever to combine it with the other image as the photo. Brilliant! Your colors were a good choice. Great card! Love, love, love it. Fabulous layout and so creative, brilliant papers and colours.